Location: Lat 43.738436 / Lon -69.798309; Maine Route 209 in Phippsburg, 14 miles south of Bath. Park Hours: Open all year; 9:00 a.m. to sunset daily unless otherwise posted at the gate. NOTICE: Starting November 26 the gate at Popham Beach State Park will be closed on Wednesday and Thursday throughout the winter. Park visitors may park in the turn lane on Rt. 209, and walk in, but there will be no vehicular access to the parking lot on those days. Current Park & Beach Conditions. A DYNAMIC AND CHANGING LANDSCAPE - Sand movement and beach dynamics have had a dramatic effect on Popham Beach, causing extreme shoreline change and dune erosion. Bordering the south side of the mouth of the Kennebec River, Popham Beach State Park is truly one of Maine's rare geologic landforms that features a long stretch of sand beach. Sunbathers relaxing on Popham's sands can see Fox and Wood islands offshore, and the Kennebec and Morse rivers border each end of the beach. Visitors can walk to Fox Island at low tide, but are warned to pay attention to the rising tides not to get marooned. The rolling Atlantic surf draws thousands of swimmers and surfers alike, and shell collecting is a pastime of many a sea side stroller. Lifeguards are on duty during the summer months, but beachgoers should note that this is a strong surf beach with undertows and occasional rip tides. Swimmers should swim within their abilities and near the lifeguard. Call the Popham Beach State Park's Hotline during the summer for current tide and parking information: (207) 389-9125. Surfers can visit www.maineharbors.com for tide information and should add 9 minutes to the Portland chart for Popham Beach high and low tide data. Popham's cultural and social history is still being uncovered. Excavations of the Popham settlement of 1607 and Fort George continue each summer. Pets are welcome on state park beaches, provided they are leashed, from October 1st through March 31st. Pets are not allowed on beaches between April 1 and September 30. Additional information about pets at state parks and historic sites. For a geologic tour of the beach visit Seawall and Popham Beach Dynamics. Learn about the geology of the area on the interactive Maine Geologic Facts and Localities map. Popham Beach State Park Garners Mention in July/August 2016 Yankee Magazine. View cover; article on page 82 of this issue. 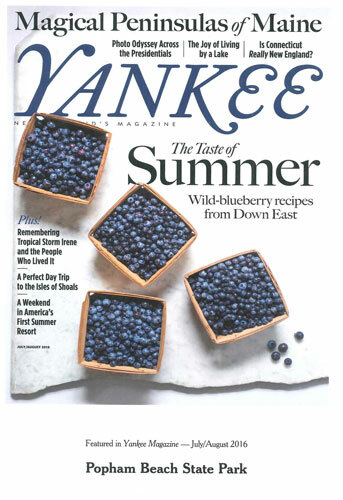 Read Yankee article online.